Topps is pleased to announce it is bringing its ever-popular Fan Favorites line to Football. From the Steel Curtain, Purple People Eaters and Big Blue Wrecking Crew to the Silver and Black Attack, America's Team and The Hogs, Topps Fan Favorites Football will feature the most beloved player combinations that the game has ever seen. The 85 base card set will feature retired football greats on classic Topps designs and all 85 true fan favorites are signing autographs for the all-new product (2 AUTOGRAPHS PER BOX). The base set will feature both Chrome (#'d to 499) and Chrome Refractor (#'d to 99) parallels. The Autographs will also have its own parallel - Team Combo Nicknames. All 85 players will sign an additional 10 cards each with their Combo Nickname such as Joe Greene signing "the Steel Curtain" under his signature. Other unique Autograph programs include Co-Signers featuring classic winning combos like Joe Namath / Don Maynard, Roger Staubach / Tony Dorsett and Dan Fouts / Kellen Winslow. There will be 6 cards in all limited to just 50 copies each. And 9 players such as Y.A. 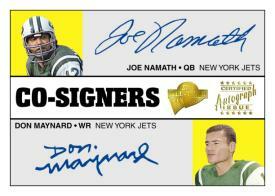 Title, Ken Stabler and Joe Namath will sign 20 of their original Topps cards. Each box will also include a sequentially numbered over-sized Team Combo card. In all, there will be 10 cards. Topps Fan Favorites, which ships the week of February 28th, carries a $5.00 SRP for each 6-card pack with each box guaranteeing 2 AUTOGRAPHS.